Whether it’s the strokes of color representing specific flavours that streak across my mind when I “see” certain flavour combinations or something as straight forward as smelling the steam wafting lazily up from a finished dish, I think, flavour has to do with instinct and chemistry. As for all the other foods, some clash and cause destruction on a plate, others are somewhat mellow and therefore go forgotten before the next meal. Then, there are still the harmony and excitement in other ensembles of flavours that make magic happen. 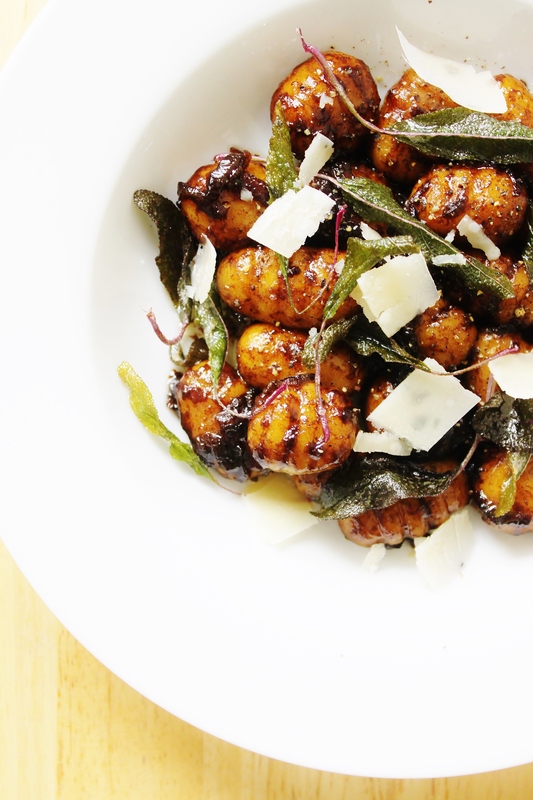 Crisp purple sage, kabocha squash gnocchi, brown butter, shaved Grana Padano, and caramelized balsamic vinegar. I think these struck a chord with me. To make the kabocha gnocchi, mix together the kabocha puree, potato starch, rice flours, and salt in the stand mixer using the paddle attachment. The mixture will look sandy and dry. Mix in the eggs, one at a time until well combined. If a dough forms and cleans the sides of the bowl, then you don’t need to add any water. Otherwise, drip in the 2 tablespoons of water as the machine mixes, until a dough forms. On a smooth, clean working surface (I did this on my countertop), roll handfuls of the dough into inch-thick logs. Cut it into 1/3-inch thick pieces, or bite-sized. Roll it into a flat-ish round between your hands then roll it on the “teeth” of the fork, giving it some pressure, and voila, a perfect little dumpling! Now, all you need to do is repeat that last step a few dozen times until all the dough is used up. Freeze them in a single layer, on a plate or baking sheet until rigid, then you can dump it all into a freezer bag for convenient storage. When ready to cook, bring a pot of water to the rolling boil. Add a tablespoon of sea salt and 2 cups of frozen gnocchi. Stir gently with a wooden spoon to keep it from sticking at the start. They are ready when they float to the top. Drain. To make the sauce, heat the butter un a pan on medium high heat. When the butter begins to foam, add the sage leaves. Now listen, because at first there will be quite a bit of noise from the water vapour escaping the leaves, but as the leaves dehydrate, there will be less and less evaporation occuring, hence less noise. Once the sputtering dies down, you know the sage is crisp, so remove them with a slotted spoon onto a plate. Then, add the onions and salt. Fry the onions until brown and crispy around the edges and the butter is richly brown – this will take 2~4 minutes, and stir constantly to avoid the milk solids from burning. Now add the balsamic and cook it down until it is sweet and sticky (reduced by a third) before adding the cooked gnocchi. Stir until the gnocchi is evenly coated in the sauce and the sauce is sticking onto the gnocchi. Serves 2, garnish with the reserved fried sage, black pepper, and shaved cheese.